Astronomers today reported that they were able to find water about 175 light years away using the Herschel space telescope. Astronomers spotted evidence of water vapor at the edges of a planet-forming disk surrounding a nearby star. The presence of the vapor hints at enormous volumes of ice present in the disk. Astronomers were able to observe the chemistry by analyzing the absorption spectra of the light emitted by the system in question. Different elements and compounds leave an electromagnetic fingerprint on the spectrum by absorbing radiation at very specific wavelengths. This is great news considering how hard it is to look for water in the universe. The presence of water vapor in our atmosphere has made it difficult for ground-based telescopes to obtain precision data from distant objects. The Herschel Space Observatory was launched in 2009 to study the formation of solar systems. Near the center of new-born solar disks—close to the star—temperatures are high enough to keep water in the vapor phase. Beyond a certain distance, called the snow line, water is frozen onto dust particles. Absorption spectra of the inner water vapor are easily detected by space telescopes like Herschel, but the outer water ice is hard to spot. We’ve gotten lucky and observed a bit here and there when conditions were just right, but for the most part, we’ve been relying on models and other information to infer its existence. 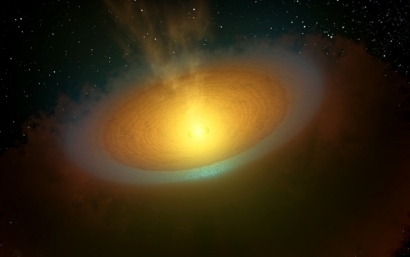 Research has suggested that UV radiation from the host star (or other nearby stars) could drive some of the water ice into the gas phase, thus making it observable again. A group of astronomers decided to use the Herschel Space Observatory to go looking for that signal, and their results were published this week in Science. They decided to point the telescope at the nearest planetary disk, which surrounds a star named TW Hydrae. This 10 million-year-old star is about 60 percent the mass of our Sun and is “only” 175 light years away. Previous Microsoft Working on TouchScreen on your Hand!